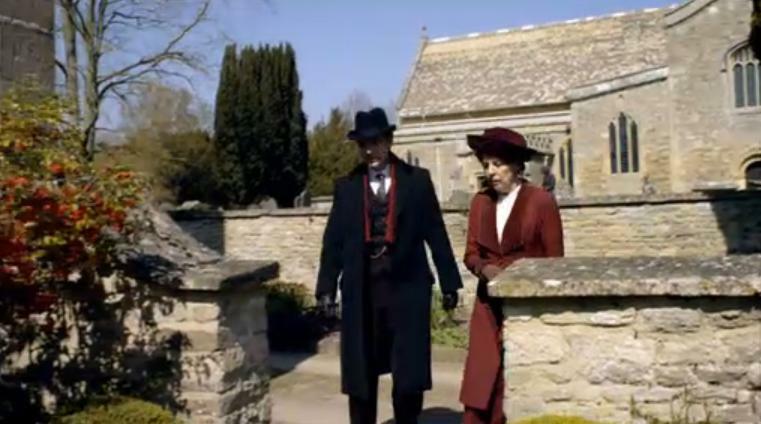 Yesterday, villagers gathered outside St Mary’s Church to watch Penelope Wilton, who plays Mrs Reginald Crawley, and Dan Stevens, who plays her son Matthew Crawley, arriving at the family home. Listen to audio samples of interviews with the actors and writer , Dowton Abbey: What is a Weekend? I don’t know Bampton, but like all Cotswold villages any new buildings have to follow strict guidelines. They have to be built in Cotswold stone. That is the main requirement and they have to conform to a basic style.Also typical English country gardens might also be grown around new developments. But, there are some allowances for modernity. The house in the background in the top picture is modern. The windows are double glazed with white PVC frames. The pitch and size of the roof is recent. Victorian roofs were sharper, higher and invariably had ornate barge boards along the eaves. If it had been 18th century or much earlier 17th/16th/15th centuries , the roofs would have been lower and smaller. That is a very big roof. An ancient roof would have been tiled with split pieces of Cotswold stone. That roof looks as though it has manufactured lightweight tiles. Also the extended window sticking out of the right side of the roof has a flat top. Victorian and certainly any 18th century and earlier windows would have had pitched roofs. Wow, Tony, you always amaze me what you bring to the table. This was a great post. I’ll watch more carefully for these kinds of things when I rewatch this episode. I’m totally enjoying Downton Abbey! Not all in Bampton. They shot some in Shilton also. But don’t tell anyone as they airbrushed in some oddities! Yes,the clip with the red bus going through the ford. And Anna entering the pub inn. There was one clip done a swinbrook at the swan as well. I’m from bampton, there back filming next week..
Bampton was our first stop in the UK in 1986 and we have been back to stay there many times. 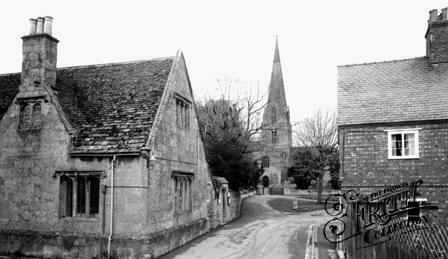 It is the quinticential Cotswold Village … original name of the village… Bampton-in-the-Bush … at least that’s what the locals told us. That part of the UK is really beautiful and laid back … a good place for a rest and as a central point to visit Oxford and the surrounds. 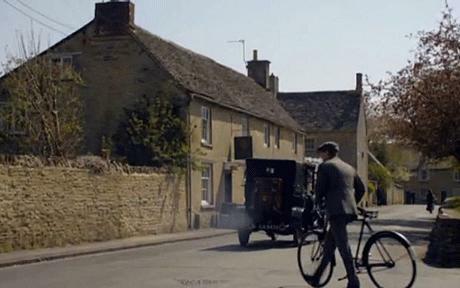 They are back in bampton filming series 3 next friday. 2ND,3RD & 5TH MARCH 2012 if anyone is interested! All day, 8am till 5pm,everyday. friday,saturday,monday.. Stunning art direction, props, autos, povs, park and hamlet exteriors, careful compositions, lighting, hair and makeup and superb LOCATIONS! Casting from heaven — and the actors do work diligently rethinking the flat dialogue to give it life. I do think Jullian Fellowes the luckiest TV writer-creator. Not only does he steal from the best, his mixage of ‘Upstairs, Downstairs’, ‘The Bucaneers’, oh-so-many BBC formula class-and-caste British soap pageantry is beyond irksome. 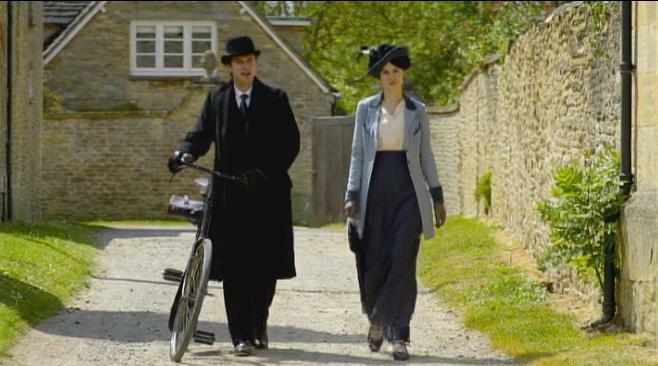 ‘Downton Abbey’ is meant to be viewed solely for the genius of its art direction. Is there no shame? Even the entire subplot of the Grand Duchess gritting her teeth and awarding the most darling old man in the village the cup for outstanding rose — well, that’s a smarmy steal from ‘Mrs. Miniver” or does no one remember that MGM classic starring Greer Garson? REALLY needs a superb supervising editor. Very clunky; it doesn’t synthesize episodically. Far too much MTV neck-snapping scene cutting without a breath or sequey. Aren’t we yet over that? A noodle between characters in ‘Downton Abbey’ is seconds compared with luscious scenes from BBC Golden Age, especially ‘Upstairs, Downstairs.’ Even Shakespeare is always cut. ‘Downton Abbey’ presents far too many characters, most merely sketched — the two sisters of Mary who by contrast is so overdrawn and hysterical she could be a Lucien Freud portrait of slathered with impasto. She plays it that way. People who read books cringe. Wondrous intentions; dreadfully executed plots and subplots. I review it for the furniture with the sound off. The reason there’s so little dialogue is that it’s so entirely unnecessary considering its predictability, drawn from all the templates we’ve sat through since the 1940s. I sincerely question Julian Fellowes’ professional integrity and capability for innovation of any kind.